Asian, Korean and Chinese cuisine are my favorite dishes. When my husband and I go out for dinner and he asks me what I want to eat, Chinese food is always my first answer. I could eat Asian food everyday and never get bored. My husband on the other hand not so much. He is more of a meat and potatoes kind of guy. That's why I take him up on Chinese food anytime it's offered. Since I don't get to eat Chinese take out as much as I would like. The next best thing is recreating those wonderful takeout dishes at home. Orange Chicken & Vegetables is my new favorite copy cat Chinese takeout meal. I found this recipe while I was doing my usual blog hopping over at Jamie Cooks It Up. (I just love that girl). When I saw the photo I was hooked. Goodness who could resist lightly breaded chicken breast pieces blended with veggies and covered in a sticky, sweet orange sauce. Yum is all I can say. My husband is a big orange flavored fan when it comes to Chinese food so; his thoughts on this dish were to add a bit of grated orange zest as a garnish. I think that might be a great addition so I will try that next time I make it. All I can say is this was the most delicious homemade orange chicken I have had. So yes this recipe is a defiantly a keeper. Next time you get bitten by the Chinese takeout bug remember this recipe and just stay home and make it yourself. Let's get started with some step by step photos. first cut the chicken breasts into 1 - 1 1/2 inch cubes. Combine the flour and 1/4 teaspoon salt in a small bowl or large zip lock bag. Toss the chicken around until all of the pieces are covered. Heat a large skillet or wok. When it's nice and hot add 1 tablespoon of oil and then add the chicken. (add in batches of two so the chicken cooks evenly) you don't want to crowd the pan or it will be harder to brown the chicken pieces. Cook your chicken until it is golden all over. (Approx 10 minutes) While the chicken is cooking, chop up your veggies. Make sure they are about the same size. When the chicken is golden brown place it on a plate lined with a paper towel. Add another tablespoon of oil into the hot skillet. Add your veggies and cook over medium high heat until crisp but still tender. While your veggies cook add all the sauce ingredients to a medium sized sauce pan. Whisk them together until they are all combined nicely. Bring to a boil. Once it boils it should start to thicken up. When your veggies are crisp and tender add your thickened sauce to the pan and then add the chicken. 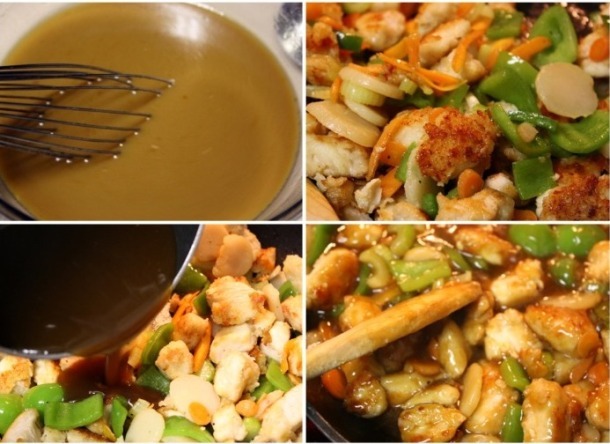 Stir the mixture until all the veggies and chicken is coated with that yummy orange sauce. Serve over white rice or Chinese noodles. There you have it fast, easy Chinese take out at home. 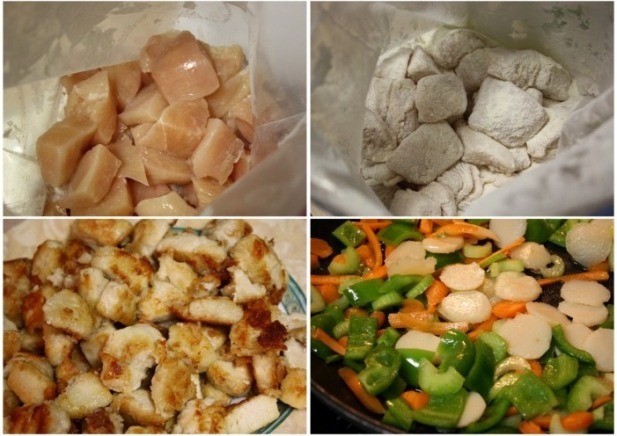 Cut the chicken breasts up into 1 - 1 1/2 inch cubes. Combine the flour and the 1/4 teaspoon of salt in a small bowl or large zip lock bag. Toss the chicken around in it until all of the pieces are covered. Heat up a large skillet or wok. When it's nice and hot add 1 tablespoon of oil and then add the chicken. (add in batches of two so the chicken cooks evenly) you don't want to crowd the pan. Cook your chicken until it is golden all over. (About 10 minutes) While your chicken is cooking up, chop up your veggies. Make sure they are about the same size. When the chicken is golden brown place it on a plate lined with a paper towel. Add another tablespoon of oil into the hot skillet. Add your veggies and cook over medium high heat until crisp tender...about another 10 minutes. While your veggies cook add all sauce ingredients to a medium sized sauce pan. Whisk them together until they are all combined nicely. Bring to a boil. Once it boils it should start to thicken. When your veggies are crisp, yet still tender add the water chestnuts, thickened sauce and chicken into the pan. Stir the mixture to combine. Serve over rice or Chinese noodles. On my way over to link up. Thank you for letting me know. Tina, you're a girl after my own heart. I too could eat Chinese Food everyday. I love the look of your Orange Chicken. It really looks wonderful. I'll be trying this one. I'm excited to try this one. I tried a recipe a few months back for Orange chicken it was a major failure. This one looks a lot better! Tina ~ I am going to have to bookmark this one! My husband and I are huge fans of Chinese food. Can't wait to make this one. That looks so yummy Tina. I love Chinese food and I always make it home because I don't care too much for the Chinese place we have. I am adding this to my to make list. So glad it turned out well! Thanks for the link back. Hope all is going well with your packing and moving! I'm still undecided about EVO. Hoping to be able to come. Would LOVE, LOVE, LOVE to see you again. Thank you I fixed husbands to husband. Yes it was a typo. I couldn't handle more than one LOL. Although if I did have two my Honey Do List would get done a lot faster. That looks delish! I'm a big fan of Chinese food too. Yum! This is my first visit here and i loved this orange chicken recipe.My orange chicken is made with marmalade and it is a dry finger food , this one with vegetables and sauce looks so hearty .....and healthy too. Loved so many other recipes by you too. There is just no good Chinese food in Raleigh and these recipes are saving me! Another one for my menu! Quick question....is the ginger you use fresh or ground? I made this tonight and we all loved this recipe! It is so delicious and is a snap to make. Thank you, thank you, thank you - I will make this often! Made this over the weekend and we loved it! I used a few shortcuts like substituting my home canned chicken and purchased pre-cut frozen oriental veggies. I added a bit more orange juice and used a brown-sugar substitute but have to say it was just delish! Sharon, you were right the water chestnuts were left off. I fixed the recipe so you should be good to go. Looks delicious! I am in the process of making freezer meals. Do you think this would freeze well? Can I use ground ginger instead of using fresh one? On the jar says, use 1/4 tsp for 1tsp grated fresh ginger. If you use ground one it should be the same amount above the recipe right? Yes, Cloey I have done that once or twice myself. How many pounds for 4 chicken breast? or How many cups did you use for making this dish? thanks! Sounds scrumptious. Wish there was a print button. G'ma there is a grey print button at the end of each post. Click on it to generate a printer friendly copy.